The CRAZY HAROLD font set was inspired by a single analog font as reproduced in Paul E. Kennedy’s “Modern Display Alphabets” (Dover, 1974). Of course the name appealed to me, as well as the tacky retro-festive style. (I welcome any additional information about this font that anyone might pass along to me.) Anyway, my font set is completely redrawn with clean edges and rounded points. I’ve incorporated alternate letterforms into separate fonts, and made condensed versions too. Coordinating “Flair” fonts have extra-groovy capitals, making eight fonts in all! 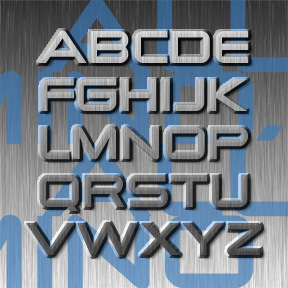 Each font includes upper and lower case, numbers, punctuation, and international characters. BARRIL is my digital interpretation of a “lost” analog font called Barrio. I started with a scan from a dry-transfer catalog (thanks, Jeff). I know it was produced originally by Neufville, but that’s all the information I have. Totally 70s! For my own amusement, I made a second inline version called Barril Doble. Great for layering. Each font includes caps, punctuation, numbers, and international characters.